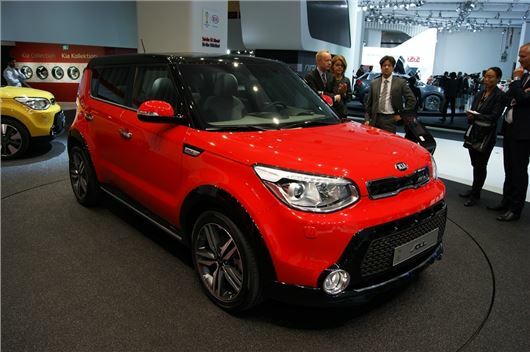 Kia has launched its all-new Soul at the Frankfurt Motor Show. It's based on the Track’ster concept and will go on sale in the UK in Spring 2014, with prices expected to start at £12,000. Based on an all-new platform, the Soul features upgraded suspension and a stiffer bodyshell to improve ride and handling. Visually, the similarities between the Soul and Track’ster are striking, with the production model featuring same front air intake and enlarged fog lights; however, Kia has introduced its signature grille to bring the Soul in line with other models in its product line-up. Power comes from Kia’s existing 1.6-litre GDi petrol and 1.6 CRDi diesel engines with a six-speed manual gearbox or an optional six-speed automatic. Both units have been tweaked for improved economy and lower CO2 emissions. The new Soul will be available with a range of new features including LED daytime running lights, keyless entry and push-button start and a panoramic glass sunroof. Inside, the Soul gets improved soundproofing and more space, with 354 litres of boot space plus an additional underfloor storage area. The car on display at Frankfurt feature’s Kia’s new ‘SUV styling pack’, which includes piano black bumper trim, side skirts, wheelarches and a black roof. Buyers will also be able to choose between up to 11 exterior paint finishes, as well as three different roof colours – black, white and red. Looks a really good car and package, suprised it hasnt sold in bigger numbers.